Stick me behind the wheel of a car and tell me to drive round the same piece of tarmac over and over again and I’ll be in heaven. The same must therefore be true if you stick me on a bike, give me a dirt track and get me to do the same. Shouldn’t it? Well, normally yes. But if that bike is in any way attached to MX vs ATV Supercross then to be honest, I’d rather not bother. 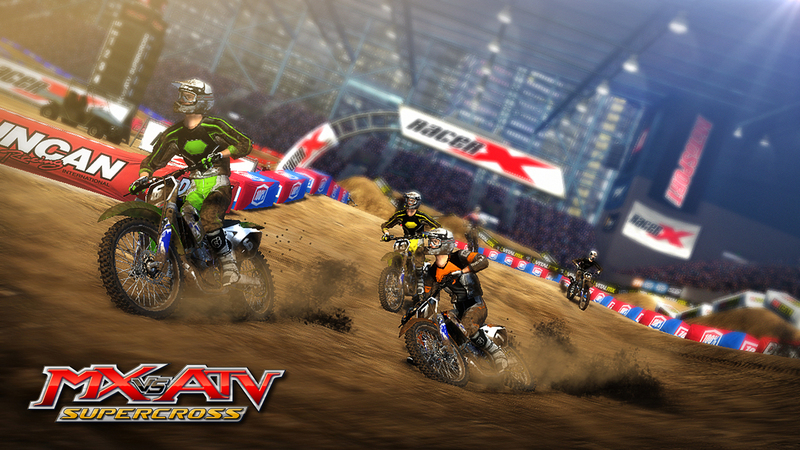 For MX vs ATV Supercross really isn’t very good. Period. I was never expecting a world beater, but I was expecting something that would possibly be on a par with the previous games in the series and after spending a little time with MX vs ATV Alive a few years back, something on a par with that would have been good. ‘Alive’ wasn’t the best title ever but it did at least manage to bring a little enjoyment to the sessions I had. Supercross doesn’t do that at all. 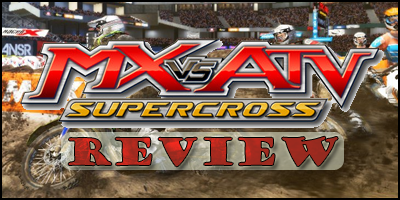 As the name suggests, MX vs ATV Supercross brings together the world of Motocross bikes, blends in some all terrain vehicles and gets you racing in Supercross stadiums over a number of laps. That’s the basic premise and if you take it solely on that idea, then the game is just about okay. But with a game, there needs to be a bit of enjoyment, a bit of fun or a sense of achievement and unfortunately none of that is present. Visually things are pretty poor, with character models being laughable (just take a look at the board girls before any race and you’ll be tempted to switch off straight away), and whilst the actual bikes and ATVs that you ride are fairly detailed, to the untrained eye they all look exactly like one another, with only some customisations in the form of vehicle colours helping distinguish between them. I’m sure a pure bike nut will be able to tell the difference and I’d fully expect them to, but with my ‘gaming’ head on as opposed to my ‘bike’ head, then I can’t see much between them. The stadiums and dirt tracks that you find yourself racing on are just about okay with some nice tracks dug into the dirt, but there hasn’t been a great deal of effort put in to creating the winding tracks; adding some blocks and throwing some flashlights into a faceless crowd just isn’t good enough for me, last generation or not. Throw in the most monotonous droning of engines and you can see why MX vs ATV Supercross bores the hell out of me, although I can’t be too harsh with the accompanying background music for that isn’t too bad at all. Race-wise we’re given the chance to compete in a single race, a career, a split screen local match up or via the Xbox Live service. All are basically the same as each other with races that see you going up against numerous AI (or in the case of the Live stuff, players from around the world), in anything up to 30 laps – YES 30 LAPS! I would like to say that the racing is tight, frantic and filled with speed but that would be telling more than one lie, as once a few corners have been taken in and you’ve sailed out in front or been left at the back of the pack, you very rarely see another rider again. The lack of any sort of minimap or counter to show how far you are from making up lost ground, or whether indeed you need to push to extend that lead means that once you’re out on your own, there’s very little to worry about other than possibly adjusting your bike to compensate for the odd jump or two. The AI on offer isn’t up to much competitive action but then neither is the rest of the game. 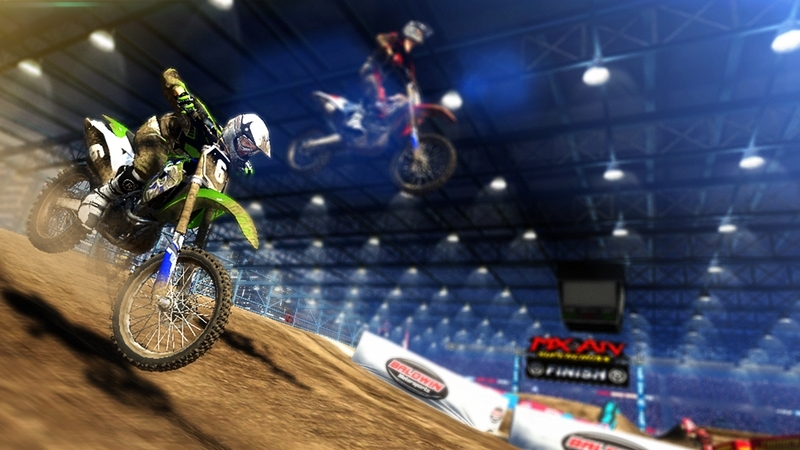 The lack of excitement and speed moves over with you into the Xbox Live races, with a matchmaking system that throws you onto an empty track, giving you the chance to ride around waiting for someone else to join. Now, we have to remember the game has only just released and that should mean the lobbies should be fairly well populated but over numerous tests across different times of day, I have never found a race that has more than four people in it….and they are all long gone once the starting gun fires, either due to them being on a faster, unlocked vehicle or, as has been the case too often, because lag makes them fly all over the shop. Hell, I’ve found myself having more fun sitting watching the spectator mode instead of actually getting down and racing, and that just isn’t right. There may be 11 different championships and more than 13 different bikes on offer, there may be many more rider outfits that you can choose from with plenty of officially licensed action and there may also be a plethora of micro-transactions that give you the chance to ‘purchase a new bike’, but if the racing itself is not much cop then no-one will bother hitting those championships, trying out those bikes or, god-forbid spending real world cash to grab the latest two wheeled beast. I can normally find some sense of enjoyment out of even the worst of games but MX vs ATV Supercross is just tedium and monotony taken to another level. ‘Race hard, finish first’ is the tag line. Well, none of that applies I’m afraid.